Vancouver rock band Dead Soft have spent the last two months tirelessly touring the U.S. in support of last year's self-titled debut, spreading the grunge-pop gospel that has made them local favourites with new audiences across the border. Fans have been eagerly anticipating the group's homecoming show since it was announced — a fact evident from both on social media and in the enthusiastic assertions overheard as the Astoria Pub steadily filled with people last night (November 7). Between the soggy Pacific Northwest weather, concertgoers clad in wool sweaters and a bill that featured other hometown sludge-slingers Doppelganger, Pinner and Slow Learners, the evening felt like an homage to '90s grunge. Doppelganger primed the crowd with feverishly delivered fuzz pierced with feedback and gruff shouts before Pinner wove their feel-good melodies throughout heavy percussion and dynamic scuzz. Slow Learners brought things to a more traditionally punk place, sing-screaming through finger-blistering thrash, including a cover of Fleetwood Mac. 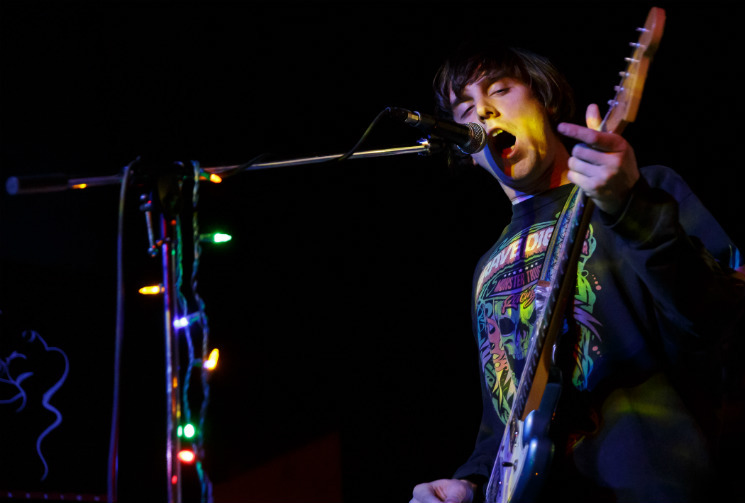 Dead Soft took the stage discreetly, lead vocalist and guitarist Nathaniel Epp wrapping a string of Christmas lights around his microphone stand as bassist Keely Rochon and drummer Graeme McDonald strapped on their instruments. Having just come off an extensive tour, the three-piece played more tightly than ever, with an unwavering energy that carried from the beginning of the set to its very end. Their transitions were seamless, dotted with minimal banter that mostly gave sincere thanks to the audience and the openers. Epp squeezed his eyes shut as he howled with throaty Cobain-like conviction; Rochon had her head down as she moved in sync with her instrument, looking up every so often to smile at her bandmates. McDonald, the quiet hero of the night, relentlessly bashed away at his skins, striking so rigorously that his mic-pack became loose mid-song and flew across the back of the room. Dead Soft's dark energy was infectious; a hard-hitting "Never Forever" incited cheers and had bodies swaying to the song's buzzy riff as it plunged up and down and warped through stomping drums and licks of bass. "Everything," delightfully melodic and mucky, prompted sing-alongs, and new track "The Wind," an impeccably executed addition to the band's catalogue, was greeted with as much excitement as the rest of the tracks. Watching Dead Soft perform, it's easy to see how they've bashed their way into the hearts of so many. They are truly just as good live as they are on their record — perhaps more so, now that they've spent more time on the road. After the last riff and another round of thanks, the band disassembled as modestly as they began. Then, happy patrons slowly filed out of the Astoria, ears ringing and air guitaring into the damp night.